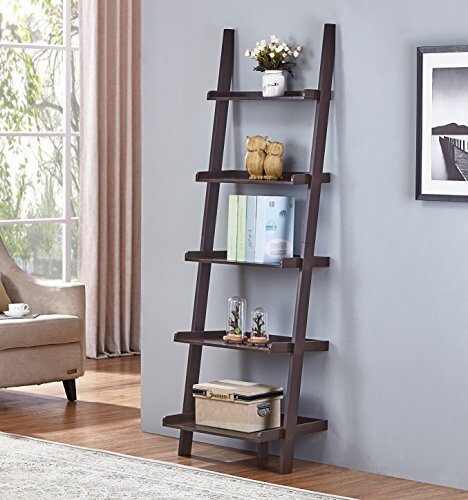 This Espresso Finish 5 Tier Bookcase Shelf Ladder Leaning - 72" Height is a great addition to your home decor. Features 5-tier of ladder shelving for all your storage needs. Can store books, decorative items, baskets, etc. Is used in all rooms. Measures 72 inches high x 24 inches long x 16 inches deep. Assembly required. Features 5-tier of ladder shelving for any home decor. View More In Cabinets, Racks & Shelves. If you have any questions about this product by eHomeProducts, contact us by completing and submitting the form below. If you are looking for a specif part number, please include it with your message.